The Carving Studio & Sculpture Center in West Rutland is a fortuitous collision of history and the present. Located amid inactive quarries and the former manufacturing facilities of the Vermont Marble Company, CSSC has a history written in stone. The former workers' presence is felt everywhere, in the quiet of rusting machinery, water-filled quarries and enormous blocks of marble. 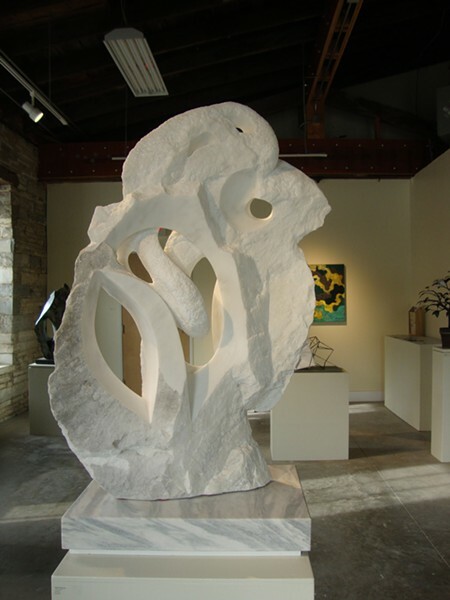 But, as much as stone may speak to history, the Carving Studio's present and future are here, too, in the art that graces the grounds and the international artists who come here to work. The theme of this year's annual SculptFest exhibition is "The State of Hope," guest-curated by artist Whitney Ramage. Referencing current political rhetoric, Ramage sought proposals in support of the idea that hope is more vital in dark times. "By examining hope from all possible angles, we will seek to gain forward momentum," Ramage wrote in CSSC's call for proposals. "One of art's fundamental purposes is to reorient us in relation to the world, to each other and to ourselves." Ramage grew up in Middletown Springs, received her MFA from Pratt Institute, and now lives and works in New York City. Her own work spans sculpture, painting and printmaking. Her father, Bill Ramage, is an art professor emeritus at Castleton University and an accomplished artist in a variety of mediums. The 11 artists Ramage selected for SculptFest work in a range of materials, often ones found on or near their chosen sites — all in or close to CSSC's buildings. 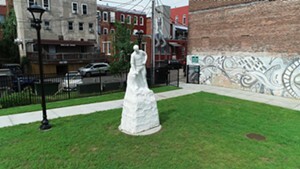 While this proximity is convenient, viewers might miss the serendipitous discoveries, in previous years, of sculptures scattered throughout the grounds. Yasunari Izaki's playful "Red Balloons" is the sole piece located inside the Quarry Store building. 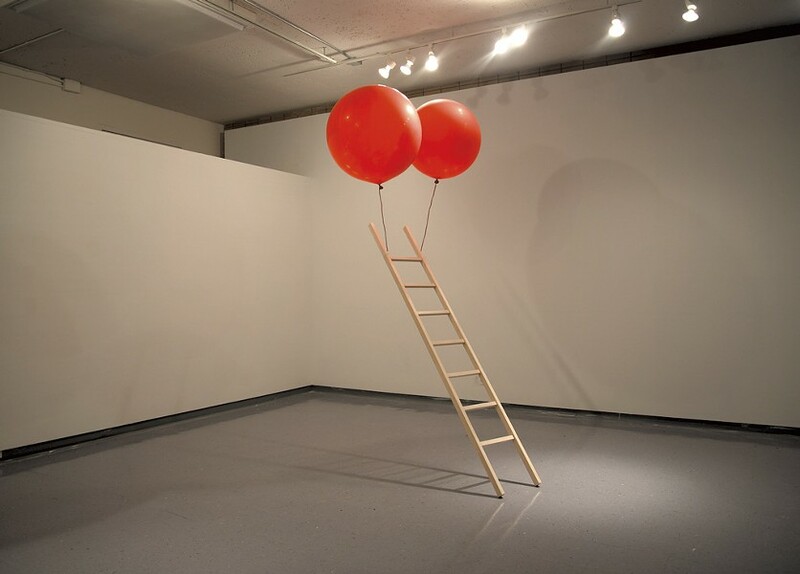 Two helium-filled latex balloons hold a 77-inch balsawood ladder in place, connected by long ribbons at an angle — a ladder to the sky, as it were. The red balloons seem to be doing the impossible. The ladder exemplifies ambition, challenge and hope, Izaki wrote in his proposal, yet this fragile structure also represents risk and fear. Over time, the balloons will deflate and the ladder will slowly fall. Greeting visitors near the exterior entrance to CSSC is "Inuksuk." Made of marble found on-site, the roughly human-scale piece is approximately 60 by 40 inches and created by John Morris with his 9-year-old granddaughter, Maya Murphy, both of Long Island. Inuksuks (or inukshuks), figures made of piled stones or boulders, have been crafted for centuries by the Inuit and other peoples of the Arctic region of North America. Their primitive human forms serve as directional markers and signify safety, hope and friendship. Inside the Gordon Marshall Coping Shop, Delaware sculptor Rick Rothrock's elegant "Arabesque" makes reference to the style created by Islamic artists who employed plant-based ornamentation. Rothrock evokes a sense of rhythm and movement in marble, drawing a connection between nature and humanity. "Arabesque" sits on a wide pedestal, which brings the approximately 42-by-36-inch sculpture to eye level. Rothrock's work is imbued with a natural grace and beauty that inspire hope. Brooklyn artist Jessica D. Adams takes a more conceptual approach in "A Penumbra, of sorts." Suspended from the iron beam of a rear studio in the Coping Shop, the work consists of long sheets of Mylar, video projection and mixed-media objects. Rainbows appear on and disappear from the Mylar, depending on where the light hits it. A penumbra (from the Latin paene, meaning almost or nearly) is defined as the region where a portion of a light source is obscured. The term is usually used in astronomy to refer to part of a celestial body's shadow. For Adams, it seems to describe clarity and obscurity, aspirations and the shadows that thwart them. Meaning is obscured in some of these artists' work. But in others, such as Ryan Smitham's "In the Pines," knowledge of the artist's intentions serves to strengthen the work in our eyes. The Calgary, Alberta-based artist harvested lodge-pole pine trees affected by pine beetle infestation and wildfire in British Columbia. He then created a series of sculptures by "planting" a freestanding treetop within a slice-of-tree-trunk base and accenting it with pinecones cast in bronze. One of these "trees," nearly 48 inches high, stands in a studio in the rear of the Coping Shop. The single treetop piece that Smitham exhibits at SculptFest no doubt lacks the impact that his whole series has together. According to his website, "This work reflects rising seasonal temperatures and the corresponding propagation of invasive species and ... the depletion of natural resources, yet also points to the restorative impact of wildfire on the forest ecology." Without his text, viewers might not grasp these implications. Works by Tom Kearns and Charles Hickey could easily be overlooked, as they subtly incorporate materials in their sites' locations. Hickey, who is from Atlanta, spent the summer as assistant studio manager at CSSC after receiving his BFA in art from South Carolina's Winthrop University. He has used one of the massive concrete bases of the bridge crane, the largest machine on the property, as a huge tablet for displaying hyper-masculine expressions. Each is carved into the concrete on its own line: "Man Up. Grow a Pair. Be Strong, Be Hard. Win the Bread, Own the Bed." Written in faint letters, these and other phrases might be seen as fading into history. Hickey's hope is that someday we will look beyond gender roles to see humans. His is a hard truth, writ large in stone. 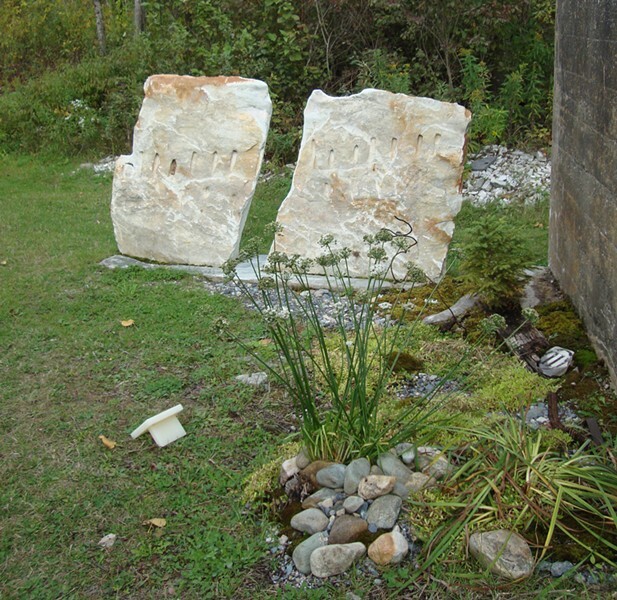 Kearns, CSSC's studio manager, worked with two rectangular, approximately 48-by-40-inch pieces of broken raw marble. He polished the cracks' exposed surfaces and placed them in a small garden environment near the footings of the bridge crane. The gap between the pieces is just large enough for an adult to squeeze through. "A Funny Thing Happened to Paul on the Road to Damascus" acts as a gateway or threshold for the viewer to traverse. For Kearns, that space represents the journey of millions of Syrian immigrants, "symbolizing the starting point for the steps needed to turn one's hopes into reality." Kate Katomski, who lives and works in Portland, Maine, and New York City, creates immersive installations in postindustrial landscapes, which have included abandoned quarries in Vermont and Tennessee. Her "Vessel of Hope" is a multimedia piece made of fibers, human hair, fabric, wire, broken stones, marble dust and a mirror. 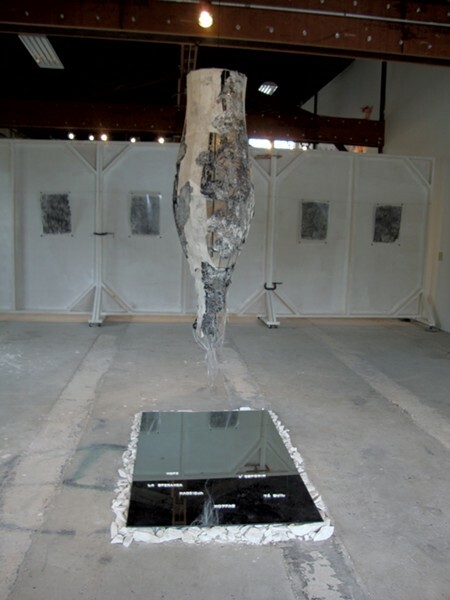 The piece fills one large studio space in the rear of the Coping Shop and creates a powerful image using found physical evidence. The large "vessel" hovers above a mirror on the floor, which displays the word "hope" in a number of languages. If the meaning of many works in "The State of Hope" is elusive, so is hope itself. But doing the work necessary to get us to hopefulness can lead to change. At SculptFest2017, artists have worked to suggest a vision for a better world. The original print version of this article was headlined "A Hard Place"